Waipi‘o Valley is a rugged, beautiful, and historic Hawaiian valley on the north side of the Big Island. 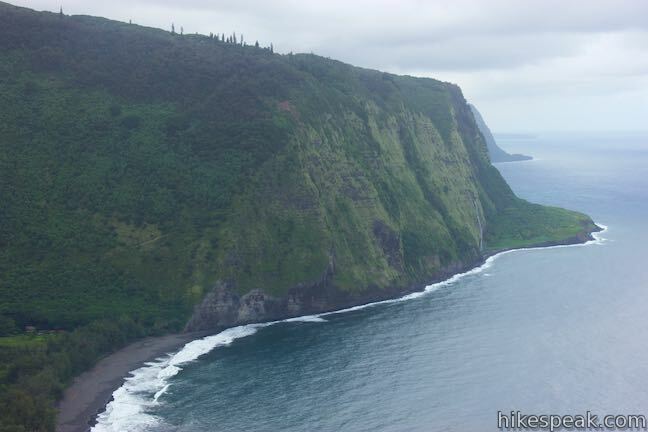 The verdant valley has a mile long black sand beach framed by steep, thousand foot-tall cliffs. 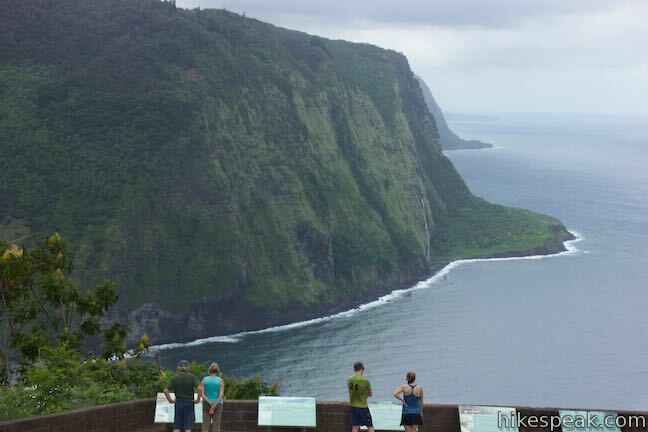 Get a good look at Waipi‘o Valley from a perch at the rim of the valley wall. Waipio Lookout has interesting info panels and impressive views. 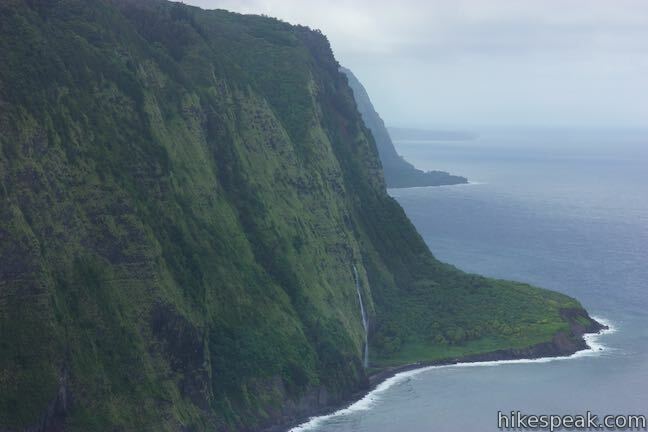 The lookout is also the launch point for a rewarding hike to Waipi‘o Beach and Muliwai Trail Overlook. 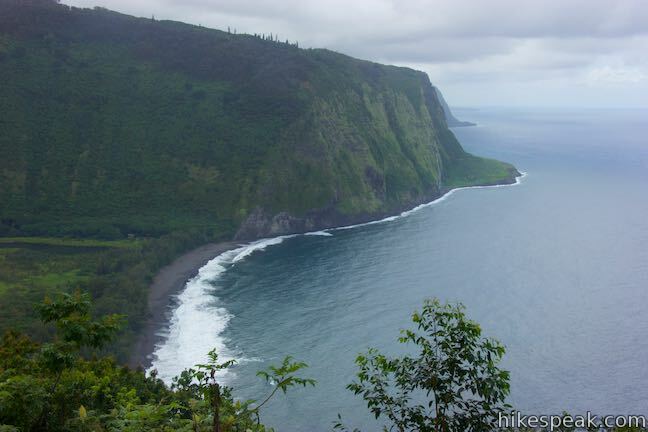 Make your way to the end of Honokaa-Waipio Road on the Hāmākua Coast on the north side of the Big Island of Hawaii. 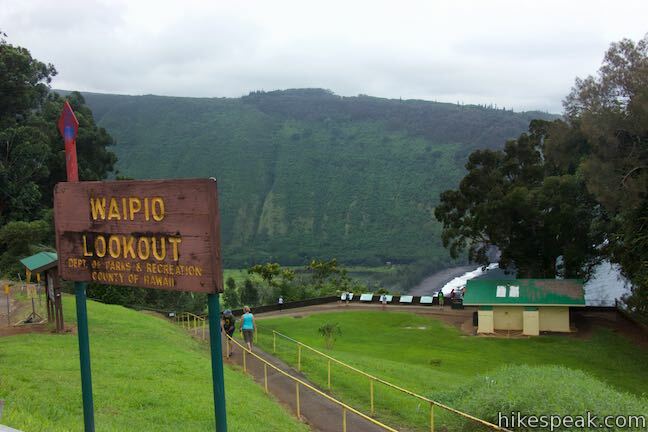 Waipio Lookout (also called Waipi‘o Valley Lookout) has a small parking area off the right side of the road. Straight off the end of Honokaa-Waipio Road, Waipio Valley Road descends toward the valley floor. This rugged, narrow, and super-steep road is for high-clearance four-wheel-drive Vehicles only. Don’t bypass the overlook for this intense drive! 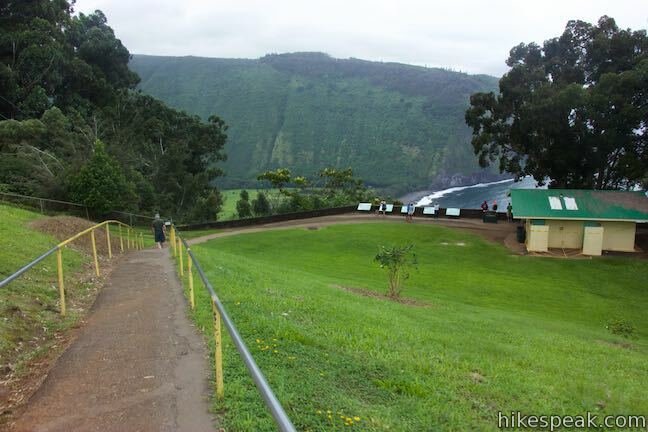 From the parking area at the scenic end of Honokaa-Waipio Road, a paved path descends around 65 feet in elevation along a grassy slope. After a 125-yard walk, arrive a collection of info panels that accompany views across Waipi‘o Valley and Waipi‘o Beach. The blue water of Waipi‘o Bay is over 800 feet below. Waipi‘o Beach stretches across the bottom of the valley, with a slightly curved arc of dark sand. While Waipi‘o Beach and the bottom of Waipi‘o Valley are easy to see, most of Waipi‘o Valley is out of view from the lookout. Gaze west across the valley toward rugged cliffs dropping into the Pacific Ocean. Around the north end of the cliffs, you may spot ephemeral Waipahoehoe Falls streaking down the shoreline bluffs. Waipi‘o Valley is known as the Valley of Kings for its regal chapter in Hawaiian history. Waipi‘o Valley was the chosen home of many Hawaiian kings. Nine rules in the Pili dynasty lived in Waipi‘o Valley, including Umi-a-Līloa, who united the Big Island under one ruler. The ancient chiefs of Waipi‘o Valley took care of the land, the people, and the gods. Only those who led a righteous lifestyle were allowed to ascend the sacred platform of the high chief of Līloa located in Waipi‘o. Līloa was a righteous ruler in the 1300s with multitudes of descendants. Historical and cultural sites are found throughout the valley, including countless burial sites. These sites are protected, so please do not disturb! In 1946, tidal waves changed the valley forever; 55-foot tall waves swept up the valley, destroying temples, both ancient and modern homes, and taro fields. Read the panels and admire the views. 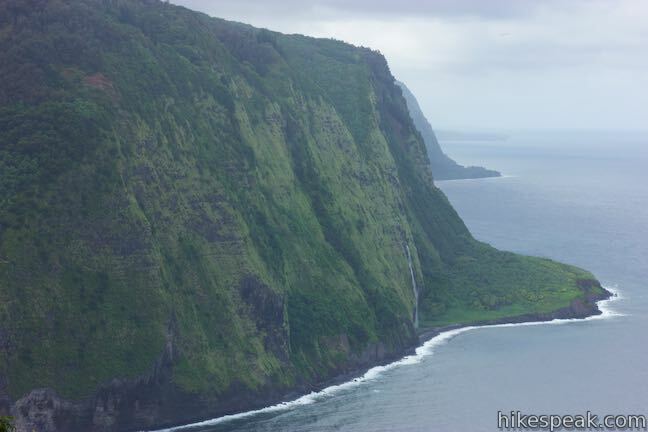 If you’re inspired, consider hiking to Waipi‘o Beach and Muliwai Trail Overlook. Otherwise, simply walk back up the path to Honokaa-Waipio Road. Another path by the lookout ventures south over to Waipio Valley Road (which could be taken to hike down to Waipi‘o Beach). 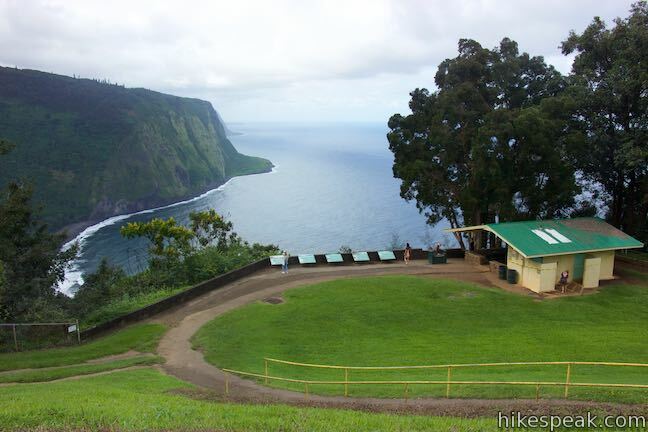 The short walk to Waipio Lookout is 0.15 miles round trip with 65 feet of elevation change. Pets are not allowed at Waipio Lookout. 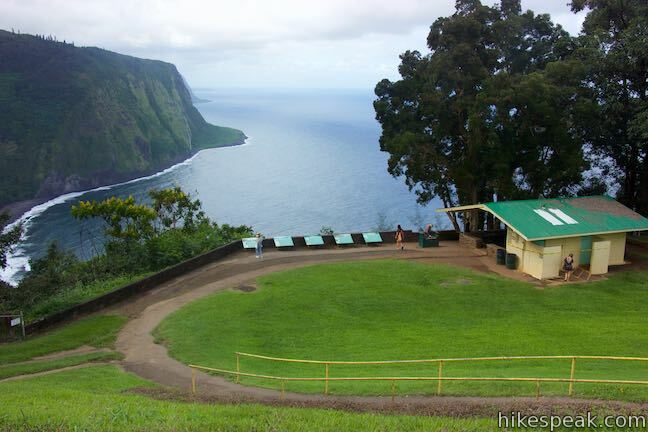 Parking beside Honokaa-Waipio Road is free and no permit is required to visit Waipio Lookout, so get out and enjoy! 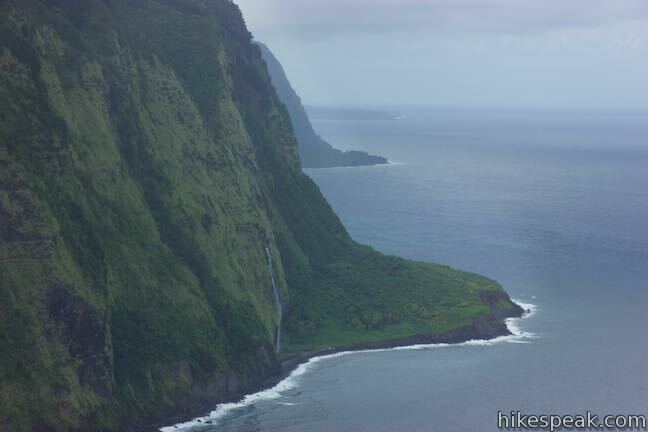 To get to Waipio Lookout: From Waimea, take Hawaii 19 east for 13.5 miles. Turn left on Plumeria Street and drive 0.6 miles down to the town of Honakaa. Turn left onto Mamane Street, which becomes Honokaa-Waipio Road (Hawaii 240). Drive 8 miles to Waipio Lookout at the end of the road.